Top 14 leaders Racing 92 made the most of Stade Francais indiscipline to romp to a bonus point 34-16 victory in the Parisian derby on Saturday. Champions Stade slumped to a third straight defeat that keeps them just one place above the relegation zone and almost certainly out of contention for the end of season play-offs. They actually turned around leading 16-13 at half-time at their Jean Bouin stadium but indiscipline cost them in the final quarter as South African No.8 Jono Ross and flanker Sylvain Nicolas were sin-binned before Samoan prop Sakaria Taulafo saw red, briefly leaving the champions down to 12 men. Racing exploited their numerical superiority to score four tries, the last in the final minute to secure a crucial bonus point that left them six points clear of Clermont, who host Brive later on Saturday. Racing’s backs coach Laurent Labit said it gave him no pleasure to see Stade struggling so badly this season. “We’re not celebrating Stade Francais’s situation, it’s important for the Top 14 to have both clubs at the top and in the play-offs,” he said. The one black mark for Racing, though, was seeing New Zealand legend Dan Carter go off injured. “It’s very tough because I didn’t feel we resigned or lacked commitment in a very difficult situation,” said Stade’s Argentine coach Gonzalo Quesada. 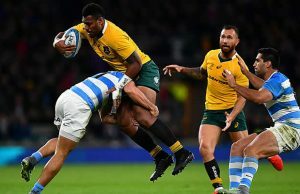 Stade were fast out of the blocks and South African fly-half Morne Steyn kicked over a second-minute penalty before Fiji wing Waisea Nayacalevu crossed the tryline on eight minutes. Stade robbed Racing line-out ball and Waisea just managed to keep his foot in play before dotting down, with Steyn converting. Racing started to wake up and Carter notched his first penalty before Steyn replied. But then it was Carter himself who finished off a stunning team move started inside the Racing 22, with the ball passing through the hands of Brice Dulin, Anthonie Claassen and former New Zealand international Casey Laulala. Suddenly Racing threatened to run riot and only a last-ditched tackle from Jonathan Danty stopped Argentine Juan Imhoff streaking in to score. Steyn and Carter exchanged penalties but the New Zealander then hit the post with another kick on the stroke of half-time that would have sent Racing in level at the break. Carter was injured 10 minutes into the second period and replaced by South Africa’s Johan Goosen before Stade imploded just past the hour mark. 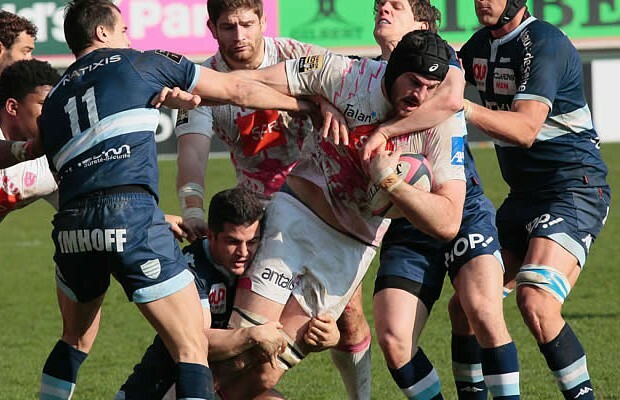 With Racing’s forwards forcing their way towards the line, Stade were repeatedly penalised for infringing with first Ross and then Nicolas shown yellow cards in quick succession. “I wonder if it would have been better to concede a try at the first maul (rather than hold out an infringe),” mused Quesada. Former Wales scrum-half Mike Phillips put Racing in front for the first time in the match after a brilliant break from Dulin. And moments later, Taulafo was sent off for a dangerous tackle on former New Zealand international No.8 Chris Masoe, temporarily leaving Stade with just 12 bodies on the field. Racing went for the jugular and Goosen strolled over for the visitors’ third try. The league leaders could sniff an attacking bonus point despite the returns of Ross and Nicolas but Fiji’s Albert VuliVuli was denied a score for a knock-on. With a minute to go, though, Dulin came up trumps starting an attack with an initial 30-metre break before popping up several phases later to finish off a great day for Racing. 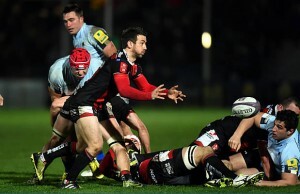 On Friday night, Toulouse slumped again as they failed to win for the fourth match in a row. Having cost themselves in their previous two fixtures by missing last-gasp conversions that would have given them a draw instead of defeat to Montpellier and then win instead of draw against Brive, Toulouse were held to a 13-13 draw at home to Bordeaux, who are now unbeaten in five. Bordeaux moved up to third with Toulouse remaining fifth.